Factory assembled backhoe with 80″ digging depth, 120 degrees swing arc. Complete with cylinders, hoses, fittings, and six section hydraulic valve. Does not include “Wobble Controls” or Bucket. 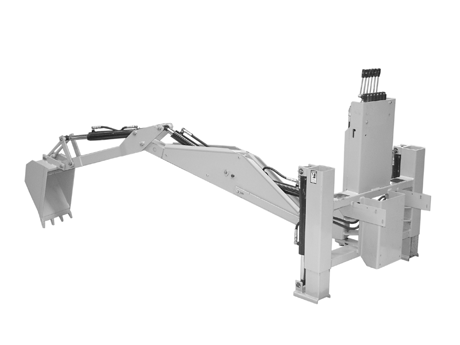 Requires: HL900 Loader (loaded with FW20 Ballast Kit), SWB54 Six-Way Blade (with SWBB Blade Extension & Weight Box), or equivalent counterweight must be mounted to front of Magnatrac for proper balance. D1065 mounts directly to the rear of the MH4900, MH8000 or any other MH Series MAGNATRACS. Lift @ Dipper: 210 lbs. Lift @ Bucket: 135 lbs.